The tiny home movement has gained popularity in recent years. Budget-friendly and mobile, micro dwellings range in size, shape, and amenities. People have been able to build tiny homes for very little money using reclaimed materials. Solar panels and wood burning stoves are cost-effective and easy to acquire. Hot tubs, however, are a bit more challenging. 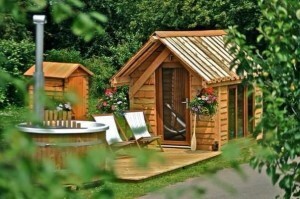 One company, Tinywood Homes, in Warwickshire, UK, saw a need for something a bit more luxurious. Hot tubs and gazebos are among the many options tiny home dwellers have to choose from. Three models of homes exist. There’s the Tinywood One, the Tinywood Two, and the Tinywood Three. Each offers a specific amount of space and amenities. The company was founded by Aidan Reeve and his friend who wanted to create a home out of a 20-foot shipping container. The Tinywood Three is based off the blueprints used in Tinywood Homes’ first project. It is the largest of the homes offered by the company. Up to eight people can sleep in the micro house. It also has a large kitchen and a woodstove-heated living room. All Tinywood homes are small enough to be hauled by truck. The Tinywood Three is also offered as an off-grid version. Homeowners will be pleased to see the composting toilet, water tank, and solar power. It is, however, on the pricier side. The off-grid model sells for $57,000 USD. It’s only available for UK residents to buy at the moment. For a budget-friendly version of a tiny home, interested parties can check out LaMar Alexander’s website. He’s written a book on how to build a 14 x 14 cabin for under $2,000. He even includes information on how to craft a solar composting toilet just in case it’s something a person wants to add to their tiny home.